I have become such a fan of using letters, words and pictures as inspiration for wall art in our home. It adds just the perfect touch of warmth and personalized style to our home décor. WallPOPS! by Brewster Home Fashion is a premier line that offers a fantastic selection of unique and creative wall art including something that I had never seen before-Dry Erase calendars, boards and more. I love our new Habitat Dry Erase Board which can be used on walls, the refrigerator etc. I simply peeled it and stuck it to the flat surface. I didn’t like the original location that I had selected so I was able to easily remove it and reposition it to another spot. There was no damage to the wall and no sticky residue to wash off. It is a generous size of 13” x 17 ¾” and includes a dry erase marker that can be attached to the board. My husband and I use this board for important scheduling reminders and even came up with a fun way to leave little love notes on it for us to discover. 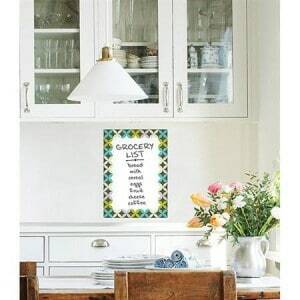 It would be a great idea for a teen’s room for reminders and important communication. There are a wide range of styles to choose from to match every décor and it is a bargain in my opinion for only $15.99. As a home educating mom, I am always looking for creative resources to teach my children and I swooned over USA-Dry Erase Map ($23.99). I had just introduced geography to my six year old and had been searching for a way to bring the concept to life. With this excellent tool, he is able to see a map up close and actually write on it during his lessons. 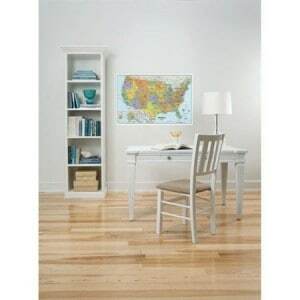 Similar to the dry erase boards, this peel and stick USA-Dry Erase Map can also be removed and repositioned. I absolutely love this map and use it every day with my children. My husband is a printer and actually prints maps at work……..he thinks this is a wonderful resource in our children’s home school room and I couldn’t agree with him more. Keeping with the learning theme, I think the Alphabet Sets are a lovely addition to a baby’s nursery, child’s room or playroom. I love the contrasting and eye catching colors of the Espresso Brown and Powder Blue Wall Letter Set which includes 87 pieces including multiple copies of the letter and punctuation. Let the creativity soar as this fun lower case letter set is applied to the wall. Alphabet Sets are available at WallPOPS! in several color combinations and is affordable at only $19.99. WallPOPS®! has excellent quality, affordable wall art to help you transform any room in your home or office. You can even create your own design, choose popular characters or select your favorite European wall art. You can purchase WallPOPS®! online or find a retailer near you by visiting the WallPOPS! website. My favorite product is the Carnivale Monthly Calendar. I like the Espirit dot and block set! I love the Anya Dry-Erase Board. It would look wonderful on my fridge! The Very Berry monthly calendar. I like the baby Espresso Brown wallpops. I like the Multi-Colored Butterflies wall decals. My favorite: Sea Dream Beach – Panoramic. I like the Des Fleurs Kit! I really like their Flower mirror decals! This would be magnificent for our family! I would love the Cameroon wall decor which matches my daughters nickname! My daughter loves the dry erase dots we have up in her room!! Would love more!! I like the Zsa Zsa Blox! My favorite is Go Retro Pink. I love the Medici Medallion stained glass window cling in sage. Gorgeous! I love the Pansy Medallion Amethyst Stained glass Decal!